SafeGround gives the possibility to use the oscilloscope inputs both as single ended and as differential. When SafeGround is active and you accidentally create a wrong connection that causes a short circuit, SafeGround will disconnect the ground of the input channel without damaging the oscilloscope or PC. You can therefore simply switch from a differential input to a single ended input without worrying if anything will damage because of a short circuit current1. And as you all know, a connection mistake is easily made, which will now have no more strange and financial consequences because of SafeGround as the short circuit current is limited thanks to SafeGround. Background: The advantage of an oscilloscope with differential inputs is that there are no connections between the channels and with the ground of the computer. It is therefore not possible to create a short circuit. With SafeGround enabled you can connect a standard 1:10 probe to your channel, this is not possible with a standard differential channel of other oscilloscope manufacturers. Sometimes it is also required to perform a single ended measurement, but then there is a risk of a short circuit. When you do want to measure with a single ended input, your input is connected to the ground of your oscilloscope and your computer (the alligator clip of your probe is directly connected to ground). The input channels are also connected to each other. When you connect the alligator clip of your probe accidentally to a point in your test subject that is not at ground level but to a point with an elevated voltage, a short circuit current will flow through your probe, oscilloscope and computer. This can cause serious damage to the test subject, the scope and the computer. SafeGround avoids this and safes you a lot of misery. SafeGround can be enabled individually for each channel. 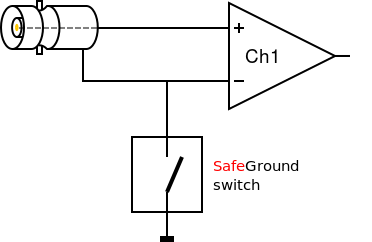 The ground current at which the SafeGround protection activates and shuts off the ground connection is adjustable in steps of 10 mA. This allows to use single ended inputs in a situation where the instrument and the device under test do not have the exact same ground level, e.g. due to voltage drop over a ground connection. The small current that then will flow could activate SafeGround. Setting the current limit to a higher value may keep SafeGround from being activated. When your device under test is very sensitive to damage, the SafeGround current limit can be set to a lower value, to give the highest level of protection. SafeGround protects your scope, your computer and your circuit under test against accidental wrong ground connections. Maximum short circuit current is 500 mA.